We hypothesized how many fails we would have to get to one success. All our guesses were off. Ally guessed 4 fails, I guessed 6 fails, and Hana guessed 24 fails. At the time, Barbara wasn’t there to guess. The real number of fails was 8. We got 2 successes, because during our first one we were too loud so we re-filmed a success. I feel bad for Barbara because she missed it, but then she got to edit most of the video, even though she wasn’t there to start it. She got most of the credit (technically she gave it to herself, but she deserves it). I think Barbara made the movie on iMovie, because I think she was more used to it. Our video starts off with me explaining the steps, then we show the fails, and then the success. During this project, our cooperation wasn’t the best. We fought a lot, and that caused us to get distracted. There were times when we were really frustrated and angry at each other, but there were times when we compromised. I think we could of cooperated more, but I feel like we were trying really hard already. Also, being in a group of four meant we fought more, but I’m also glad we formed a team because we got to know each other a lot more, plus this was a great learning experience. Overall, I think out of ten, with ten being the best and one being the worst, I would rate our cooperation a seven. I would rate it a seven because we didn’t cooperate that well, but it was really hard because we were in a group of four. If I was in a group of two, however, I would rate it a six or five. The biggest challenge we had was when Hana’s brother got the flu. We were close to finishing building our machine when he got it. Hana’s parents didn’t want us to get the flu from Hana’s brother, so they moved the machine to my house. We had to rebuild the whole machine at my house, and we were running out of time. Hana’s basement was bigger and emptier, so at my house we had to squeeze the machine so it would fit, and we couldn’t keep it there for long. And a few days after Hana’s brother got the flu, Hana got it, too. Hana’s mom gave Hana’s iPad to Barbara’s mom so Barbara could work on our video, since we recorded everything on Hana’s iPad. We used WeVideo, since we already knew how to use it, but we found out that WeVideo is a whole lot easier to use on the computer. So while we were using the iPad, we had some trouble. I think that the challenges effected us, but we tried hard to overcome them. 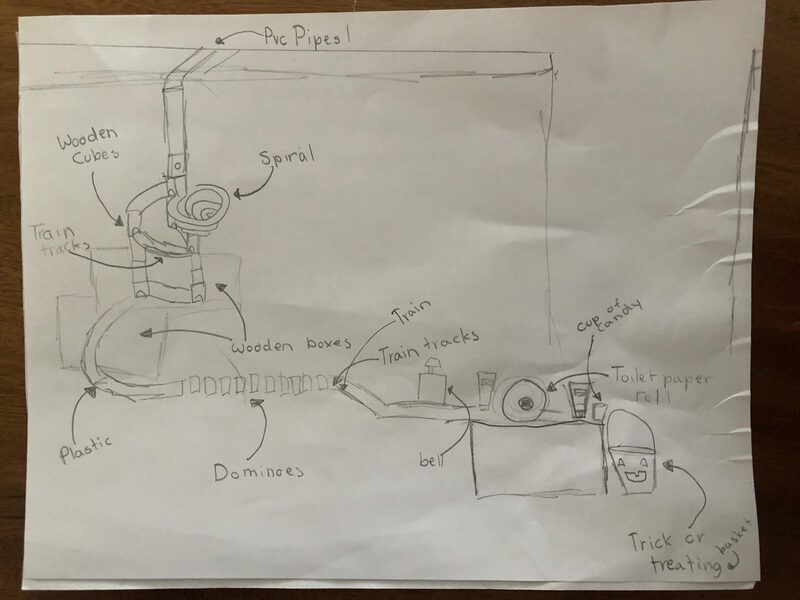 My team drew our Rube Goldberg Sketch on the long weekend of Martin Luther King Jr. Day. The sketch would be due in a few days, so they had to meet to finish it, even if it was without me. I was currently in Vermont skiing, and so I couldn’t contribute. They arranged a sleepover to finish it at Hana’s house, and they succeeded in finishing it. They drew our sketch, then showed me it. Our sketch was simple enough, drawn on a piece of paper. Our sketch was different than our final machine, because we realized some things worked and others didn’t, so we had to change a few things. 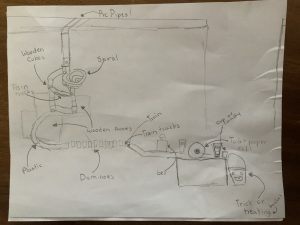 Our class was assigned a Rube Goldberg Project. We had a choice to work in teams (four people max. ), or work alone. Personally, I prefer to work with people. I thought I should keep my group to two or three people, because a team is smarter than one person, but groups four would be too many different schedules, and too many people with different opinions. So, I turned to Ally and Barbara to be with. However, while we were discussing who’s house to build the machine at, Hana came over and asked to join us. She also wanted to work with somebody, and it would be mean to just say no. So we discussed it, and it took a lot more thought than you would expect. We were thinking if we should all work as a group of four, or if we should break up into two teams of two. If we were in one group of four, things might be slower to do, but if we split up into two teams of two, we might of wanted to be with another person who wasn’t in our group. Finally, we decided to work in a group of four. The thing that made us make our decision was that Hana was the only one who had space to build a Rube Goldberg Machine, so if we worked in groups of two, the group without Hana wouldn’t have any space to build anything. After finally sorting out our teams, we started to plan. It was a day or two after I figured out who I was going to work with in the Rube Goldberg Project when my team met for the first time. Usually we wouldn’t all be free, but it was a snow day which meant there was no school, so we could meet during what would of been the school hours if it hadn’t been a snow day. They came over to my house, even though we were going to build the project at Hana’s house. We tried to draw the sketch, but we couldn’t really because we had no idea what Hana’s house looked like, so we didn’t know how much space we had, or anything like that. To be fully truthful, however, kind of used the excuse of not knowing what Hana’s house looked like to play. We weren’t really a productive group, so I was having some second thoughts about working with four people already. A day after our first meet, we met again because it had snowed so much the day before, that our school gave us another day off. This time we went to Hana’s house so we could actually start the sketch. The day before we had made a list of materials we wanted to use for our machine. Each of us brought some of the materials over. We looked at our materials, and thought about how we wanted to start it, how to end it, how many steps to include, and so on. While we were brainstorming the simple task that would end our machine, we thought up a lot of things it could end with, but we couldn’t all agree on one. So, we decided to leave that for later, to not waste too much time. It was kind of weird that we started to build our project before we started the sketch, but that’s what we did. We did it because we didn’t know how we wanted to start it or end it, so we couldn’t draw something because it might be drawn in the wrong spot once we develop our plan. When we left that day, we had succeeded in building a wooden marble track. On November 30th, 2017, our class of 5th grade put on a presentation for our parents that explained everything about our rocketry unit. There were five groups during the unit: Rockets Inc., Radical Rockets, Rocket Crushers, Flying Savages, and Rampaging Rockets. The first three groups presented today (Rockets Inc., Radical Rockets, and Rocket Crushers), and the last two groups (Flying Savages and Rampaging Rockets) will present the day after. I am in Rocket Crushers, so today I presented. I felt a bit nervous, but it wasn’t like I was freaking out about it. I presented with the rest of my group: Karine, Matthew, and Noah. When we first started the unit, we made inspiration boards, where we put useful pictures, diagrams and quotes that were useful for designing and building our rockets. Then, we started our repeating process. Each group made their own body, fins, and nose cone. Then they launched it and graphed their results. Then they repeated the process for rockets 2 and 3. After all our rockets, we reflected on our group collaboration and on the rocketry unit as a whole. The final step was presenting the slides we made during the rocketry unit. But before that, each group had to practice countless times, in the classroom, in the computer lab, at home. Every week we went to the computer lab to practice, then we came back into the classroom to tweak little things and practice, practice, practice. After every day, we went home to revise and practice some more. Finally, when we were finishing things up, we presented for the parents! It was a fun experience, and after we finished, everyone was proud. It was truly unforgettable, I know I will always remember this unit.